Originating from a dense area, I love to occasionally wander about small town New York looking for recreation and occasionally a splendid cup of coffee. Lots of rich history and state parks dot the landscape but sadly, good coffeehouses are rare in the Empire State. Yet despite the odds, I remain optimistic and try to see what turn out to be poor coffee stops as pit stops. And sometimes, the need for a pit stop trumps even the urge for coffee, such as one particular trip through the local town of Geneseo where my entourage found reprieve at a cafe called Muddy Waters. Geneseo seems to have a single main street and Muddy Waters exists as one of its several cute shops, with a deep purple exterior and a bordered row of outside tables. And while the outside is nice, the real attention to decor shines inside, as the two-leveled shop has pleasant lighting and an overall rich atmosphere. 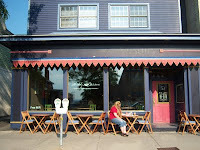 The coffee comes from Finger Lakes Coffee Roasters, a favorite in the area. I ordered the Organic Guatemalan, a decent coffee with a smooth taste but little other flavor. The espresso was pulled decently and demonstrated both bitter and bright with hints of vanilla, ginger and an overall sugary sweetness. The tea is free leaf. Given my experience, I would say that Muddy Waters clearly gave a decent showing. If you happen to exist near Geneseo (or in Rochester near their other location), take a dip in Muddy Waters. Nice site. I've been thinking about visiting coffee shop in the midwest and reviewing them for my site Coffee with Jeff! I wonder if this shop has any connection to the Classic Blue singer? Hi Jeff! I work at Muddy Waters. The owner is in a band called MudKings, he is a big fan of the blues singer Muddy Waters and so he named his coffee shop after him.